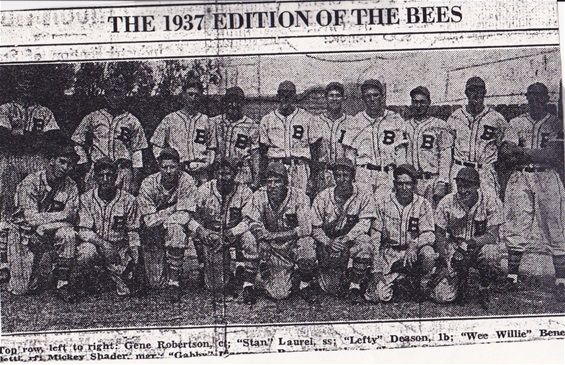 Playing for the "Buzzing Bees"
In the spring of 1937, Bernie reported to Arizona to play second base for the Cincinnati Reds' farm team, the Bisbee Bees. The April 15 edition of the Bisbee Daily Review noted the following about the ball players on the local team... "Bisbee has a farm agreement with the Cincinnati Reds. Every man on the local club is a possible major leaguer. The reason that they are signed to a Bisbee contract is because Shader believes that they have the ability to make the grade in faster company after a season more of playing in this class of baseball. They are the pick of more than six hundred boys who tried out." The team, known to journalists as the "Buzzing Bees," spent a good deal of time traveling throughout the southwest to cities such as Tuscon, El Paso, and Albuquerque. Their playing calendar ran from April 15 through Labor Day. Bernie was not accustomed to the hot, dry climate. A typical account noted that ...The spectators as well as the players took it on the chin yesterday as the wind howled and the dust blew. Apparently it wasn't just the temperatures that ran hot on the baseball diamonds. 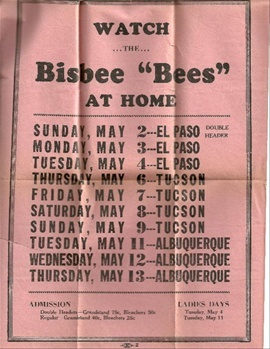 After a game against the Albuquerque team, local headlines claimed "Bees Beaten in a Close Game Marked by Fist Fight." Regarding what came to be known as the "Battle-Royal" Mickey Shader stated, "The umpire called one of our runners out at first base. I can't remember who he was. There was an argument over the decision, and the first thing I knew ball players were all over the field fighting and wrestling." 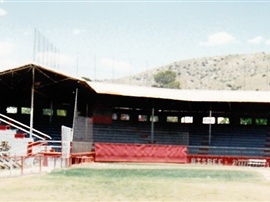 Bernie played many games on the Bisbee home field at Warren Ball Park. A newsclipping noted that in one game, he made two hits, one three-bagger and a homerun, and four trips to the plate. Later in the game he turned one his five fielding chances into a double play, unassisted. Ask us how to make a website about someone who is special to you!